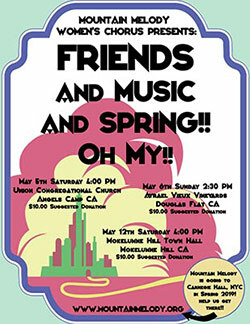 Friends and Music and Spring–Oh My!! Their musical selections are sure to cleanse your winter burdened palates and bring lightness and joy to your life! The songs include “Jitterbug” from Wizard of Oz, “It Don’t Mean A Thing (If It Ain’t Got That Swing)” from Duke Ellington, “The Rhythm of Life” from the musical “Sweet Charity” and many other fabulous tunes. Mountain Melody Women’s Chorus is known around Calaveras County for their beautiful harmonies and lush, blended tones.